Owl and Sparrow | there are many novels in the world. i'm writing one, and doing my best to write it well. Just wanted to drop an official note here in case anyone stumbles on this site looking for more up-to-date news about me or my writing—especially The Sandcastle Empire, my forthcoming YA novel with HarperTeen, which will hit shelves in Summer 2017. 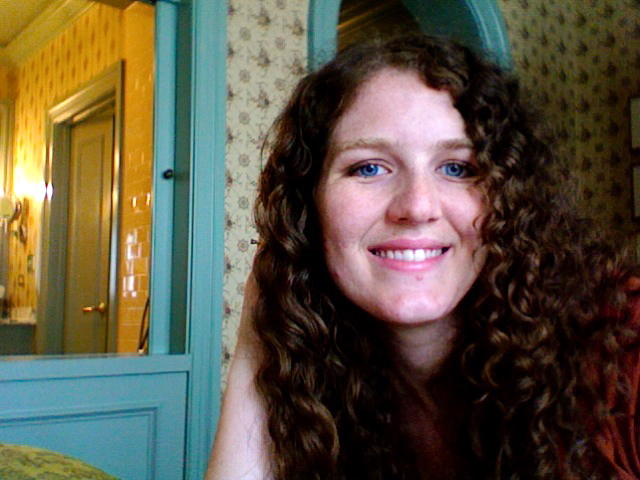 My new, official landing space is www.kaylaolson.com—I’ve put contact info there, in case anyone here wants to say hey through email or other social links; you’ll also find current book-related news/how to pre-order The Sandcastle Empire/a resource page for writers and readers. It’s amazing, really, what can happen when you admit you need accountability. After telling said friends my intentions of making June a month of EPIC PRODUCTIVITY (always all-capsed, btw—it makes it feel even more epic-slash-dire than it would otherwise, and thus, I find it all the more motivating), I basically assumed I’d start being productive again, well, on June 1. No pressure this week, I told myself. May threw some unpalatable curveballs—take the last few days of the month off, sit back and rest until it’s time to have EPIC levels of motivation! This is not what happened. I woke up last Tuesday feeling energized and determined—FIVE whole days before energy and determination were scheduled to arrive. (I credit my husband for suggesting we go to bed early the night before, and also for giving me an amazing coffee machine for Christmas.) All it took was a little optimism, a good night of sleep, an enticing pot of fresh brewed coffee, and—and this is the big thing for me—the willingness to sit down and write something even though I only had about twenty minutes before my toddler got out of bed for the day. That twenty minutes kickstarted me for the whole week. The whole month, really. But it isn’t just about a kickstart: it’s about sustaining that momentum. Therefore, I thought it might be fun and helpful to share my Triple-Whammy Productivity Recipe in case you, too, need an incredible June to make up for a beastly May. If you are a person whose life evaporates during times you’ve set aside to work on your project (thank you, Twitter! )—or if you are simply a person who loves timers, bright colors, cute icons, and an app that dings when you’re scheduled to switch tasks—I highly recommend the app 30/30 (available for iProducts)(link here, or in their Twitter bio). Liza is only *one* of my productivity genies. I use it every time I sit down to write. Though I’m a focused person by nature, 30/30 helps me pursue the task at hand with even more vigor than usual. When it tells me to write, I write hard. When it tells me it’s time for a tweet break, time to get some coffee, or time to text one of my accountability partners for a progress check-in—I relax a little and enjoy the break without feeling guilty. When it *dings* at me again, I know it’s time to get back to work. (You can customize the tasks however you want—you set the time length, the task title, and the order in which they circulate. I am very thorough, and include everything I might possibly do while working. See also: Tweet breaks.) In short, 30/30 is a very pretty, very effective little drill sergeant. There are many reasons I love my computer-programming husband—one of those many reasons is the website he created in response to my intense love for tracking progress on my various projects. The beta site for myWriteClub—a progress-tracking social media website for writers—has been live since January of this year. I don’t know why it’s so motivating to see my progress bar inch closer to 100%, or to see my graph morph from plateau to Mount Kilimanjaro…but it totally is. ➳You can connect with friends, see their progress, and leave comments to encourage each other. You can elect to receive email updates (or not) as they make progress toward reaching their goals. For people who are energized by other people’s energy, this is a really motivating feature. You might notice I am not yet at Mount Kilimanjaro levels. This is what June is for. 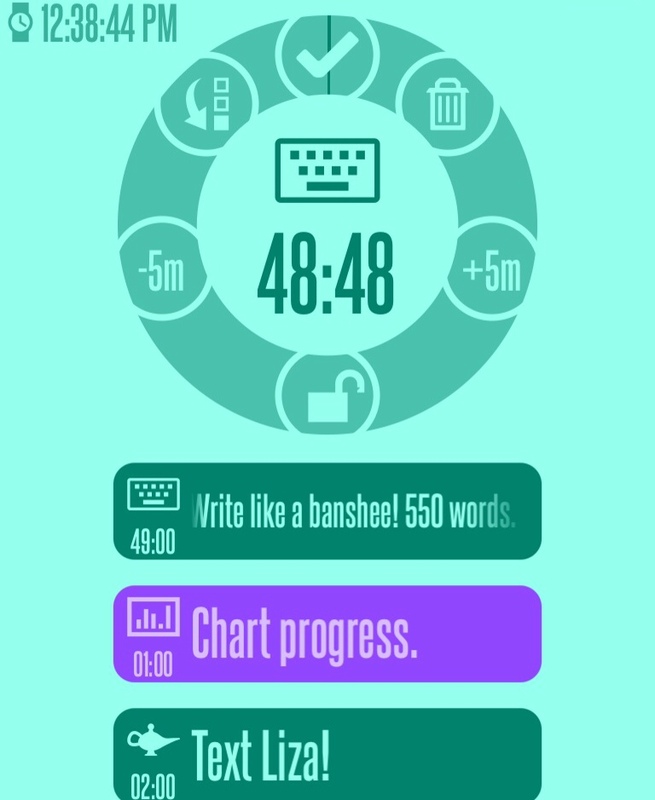 ➳You can customize your unit of measure: words written, pages read, percent complete, etc. The versatility makes it easy to use for tracking things like manuscript critiques or lines of poetry written. ➳People can see your progress, if you’re motivated by that, but if you prefer to track your goals without the whole world seeing, you can pick which goals you’d like to keep private. ➳Even when you don’t feel like you’re getting very far, every little bit of progress adds up. 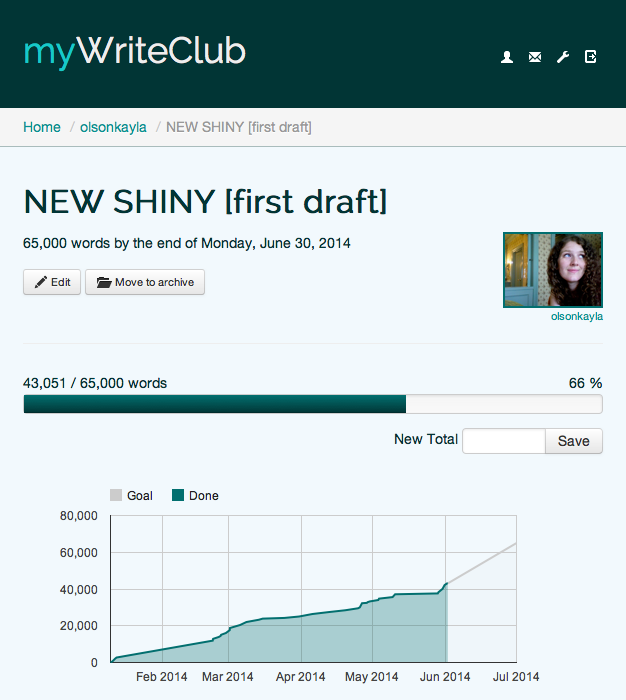 The progress bar and graph on myWriteClub are so effective at proving that you are, in fact, getting somewhere. ➳The progress bar turns green when you reach 100%. Maybe it’s just me, but there’s just something so satisfying about that! If you decide to join myWriteClub (link above) and want to find me, my username is olsonkayla. There is a certain sort of energy that comes from striving alongside other people who are equally dedicated to smashing their goals. When I say support network here, I’m not just talking about all nine gazillion of your Twitter followers. Rather, I’m talking about your 2–5 friends who plan to work diligently and frequently toward their own goals while *also* cheering you on toward yours (and/or challenging you to try when you feel oh so blah). Whenever I sit down to write, I shoot out some messages to those friends to see if they’re working—or, at least, to see if they’d be willing to check in on me in an hour to see what kind of progress I’ve made. I can be productive on my own, for sure, but why not form a support network? It takes a solitary pursuit and gives it a social aspect. That *fun* aspect—combined with people who legitimately do care about you and your progress—makes all the difference on days when your energy levels are trying to convince you to ditch your work session and sit back, eat chocolate, and pet your cat instead. I’m home from DFWCon, which means my whirlwind month-of-AWESOME has come to a close. Between a workshop led by one of my favorite authors, an out-of-state trip to visit family, and a weekend spent hanging out with new and long-loved writer friends…well, I’m a little tired. Factor in the emotional highs (“They like my project!”) and lows (“My query needs pruning, just like most people’s! Epic sadface! I wanted PERFECTION ON THE FIRST TRY!! !”)—and the fact that I’ve spent every free minute working on my project for longer than I can remember—it’s more accurate to say I’m a lot tired. Here’s what I want to do: get up at 5:30 every morning, like I often do, and work until my baby gets up at 8. Pore over notes from the awesome classes this weekend, read craft books until my eyes bleed. (I could do without the eyes-bleeding part, but you get the picture.) Dive back into my manuscript and—*waves magic wand*—infuse it with BRILLIANCE. And I will do all of those things. STEP ONE: Sleep. Because I must. I’ve fallen asleep at 9pm for two nights in a row, and it has been absolutely glorious. My body, my mind, my heart: they need to be re-set before I go pushing them to their limits again. And, oh, will I push them, because writing a novel takes discipline and dedication. STEP TWO: I’m going to read—*gasp! *—for fun. I’m a very all-or-nothing reader. Once I get into a book, my writing discipline tends to go out the window. Over time, I’ve learned I have to be purposeful about not starting a book when I’m trying to meet a deadline. It’s been a couple of months since I’ve had a reading week, so this week, I’m chilling with books. Other people’s books. (Specifically: two Sara Zarr books + SERAPHINA + ELEANOR AND PARK.) I am always inspired when I read knock-your-socks-off books, and these come highly recommended. STEP THREE: Enjoy my family. My husband and I tend to get excited about our projects, so much so that our evenings are, like, brew a pot of coffee and work-work-work. (He’s creating this amazing website for writers—it’s a social media site for writers to track their goals and progress while connecting with others who are doing the same thing.) While I’m sure we’ll still do a bit of work, it’s nice to be more relaxed about it. I’ve been a little too set-the-timer-and-FOCUS militant, lately. Balance is a good thing. Rest to be restored, not to disengage. Though I’m taking a break from the actual work of shaping words into a complete novel, I’m not disengaging my mind. Quality sleep, enjoying life with friends and family, reading to be inspired—these things are all so, so important when it comes to nurturing our craft. My project-specific ideas will be simmering on a back-burner during all of this. When it’s time to sit back down to work, I’ll be refreshed and restored, ready to FINISH this thing. Friends! It’s been a while, no? While it’s been fabulous (and sanity-saving!) to keep up with many of you through Twitter, I figured it was about time I updated my lovely little blog again. I’ve spent most of my unclaimed-by-baby-or-meal-making time doing one of four things: reading published novels, critiquing unpublished novels, working on my own projects, and investing in friendships with other writers. I highly recommend all of these, especially if you are trying to become a stronger writer—I’ve learned so many things over the past year! Reading published novels sometimes feels like you’re just relaxing, especially if you’ve created lofty goals and deadlines for yourself. It’s such a valuable use of time, though! For one, there’s bound to be at LEAST one book that totally floors you by its ability to stir your emotions, for the way the writing looks so effortless. (Deceptively so, of course.) That book, for me, was R.J. Palacio’s WONDER. There are also bound to be books you don’t have as strong a connection with; this is also valuable, because it shows just how subjective this industry is. What works well for you doesn’t always work for someone else, and vice versa. Critiquing unpublished works, for me, is an invaluable experience. It is SO MUCH FUN for me to work my way through projects and take an objective look at what’s on the page. It’s like a puzzle for my brain to figure out what works, what doesn’t, and what would make the story even stronger—even if it’s already super strong. Then, there’s communicating all of that in a tactful, succinct way, all while walking the fine line of my-opinion-is-valid-but-it’s-not-the-only-opinion-out-there. Critiquing the work of others not only helps me come back to my own projects with fresh eyes, but also with the ability to more quickly spot problems of all sorts (and their solutions). Working on my own projects: my progress has been steady, but slow. Creating something of my own takes a different sort of energy than analyzing something created by someone else—I find it’s sometimes hard to focus in a way that’s conducive to creating when my writing time is limited to 45 or 60 minutes at a time (thanks to Jamesbaby’s not-so-long naps). I’m learning, though. I think the key is to use whatever limited time I have to its fullest, and then to think specifically, when I do. If I try to attack my entire to-do list all at once, it’s daunting and overwhelming. Instead, I bite off exactly what I think I can chew in 45 minutes, chew it, and then pick up in the same way whenever I next get the chance. Nothing too revolutionary in that approach, but it can be surprisingly difficult to implement. As for the projects themselves, two (out of the many in my head) are coming together quite nicely. 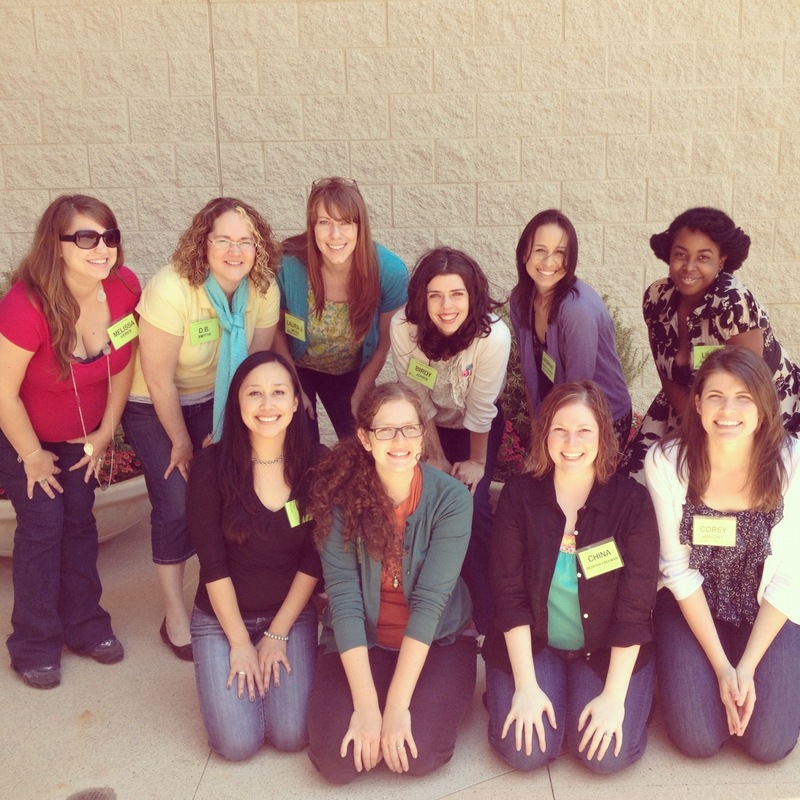 Investing in friendships with other writers: oh, man. This is another one that might, on the surface, seem like just a fun thing to do that gets in the way of actual writing. But…no. I’ve found some other writers who are committed to their goals—writers who are consistently working toward those goals—and the energy is contagious. Someone is bound to be feeling super motivated, which comes in handy because someone is also bound to be feeling completely overwhelmed. I’ve learned so much, and have felt abundant motivation and encouragement, from the girls I’ve come to know through Twitter (collectively known as #twitterbloc—it takes up less space in a tweet than tagging everyone). Oh, man. This whole writing-a-novel-while-being-a-full-time-mom thing? Not easy. New Year’s Resolutions work well for me, though, so despite the fact that I have next to no time to myself these days—and the fact that my trusty MacBook’s battery decided up and keel over—I’ve managed to make consistent progress on my draft. I expect, now that my new BFF (read: supershiny MacBook Air) has arrived, I’ll be able to add even more words. Add to those things the encouraging feedback a friend gave me recently, and I’m super-motivated to finish the draft. So. This is just a quick little post to check in and say YAY I’M WRITING AGAIN AND YAY IT’S GOING WELL AND AHHHHHHHH. Ahem. How are your New Year’s resolutions holding up so far?